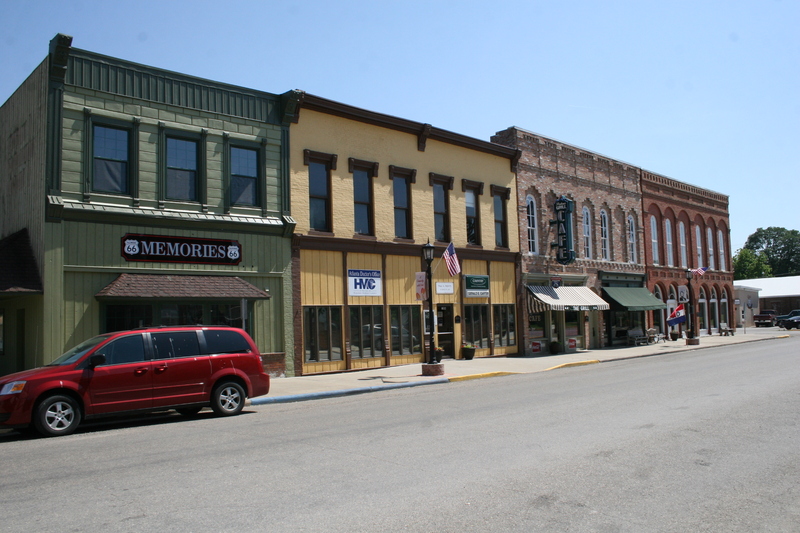 The little town of Atlanta IL has become a big stop for motorists traveling old route 66. With a population of just 1,700 it boasts a very unique old route 66 downtown on Arch Street that also includes the towns very own muffler man named Tall Paul. The area also includes an old diner, clock tower, route 66 antique store as well as other quant businesses. 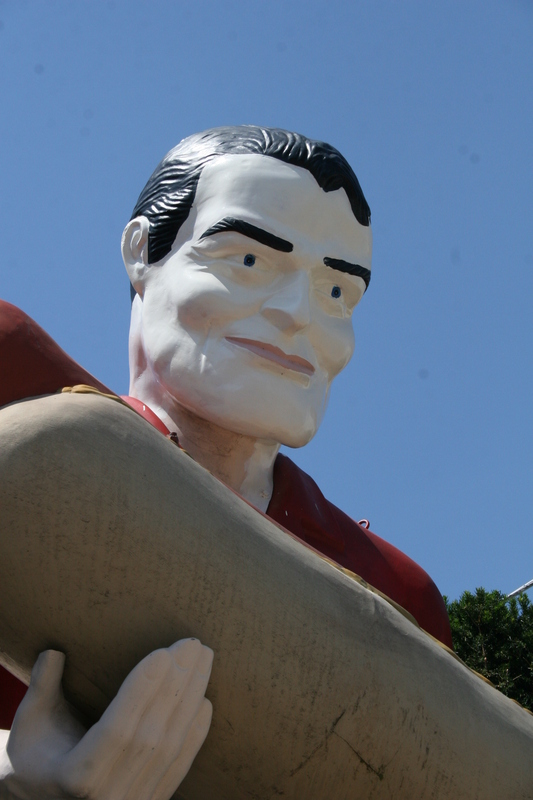 The muffler man is one of most iconic muffler men that exist today and the only one I know of to hold a giant hot dog. He appears to be a Bunyan version except for his clean shaven face and the lack of a knit cap. 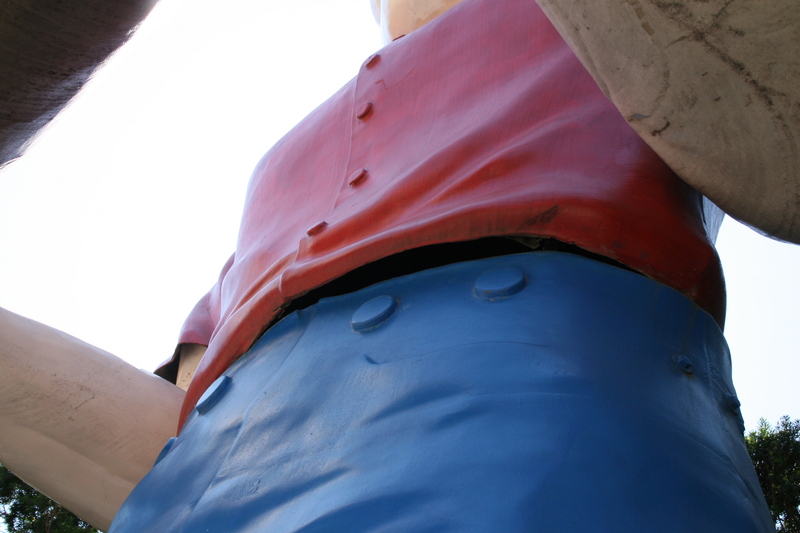 International fiberglass customized many of their giants to meet the customers needs so he is a bit of a cross breed with a cowboy head but with bunyan pants. He also appears to be made in the early days of International Fiberglass and is one of the few muffler men left to hold a custom accessory. I spotted him on our muffler man road trip last summer and he is a part of the first season of American Giants (episode #3). Along with that giant hot dog this muffler man also comes with a pretty interesting story that started back in 1965 when he was made. 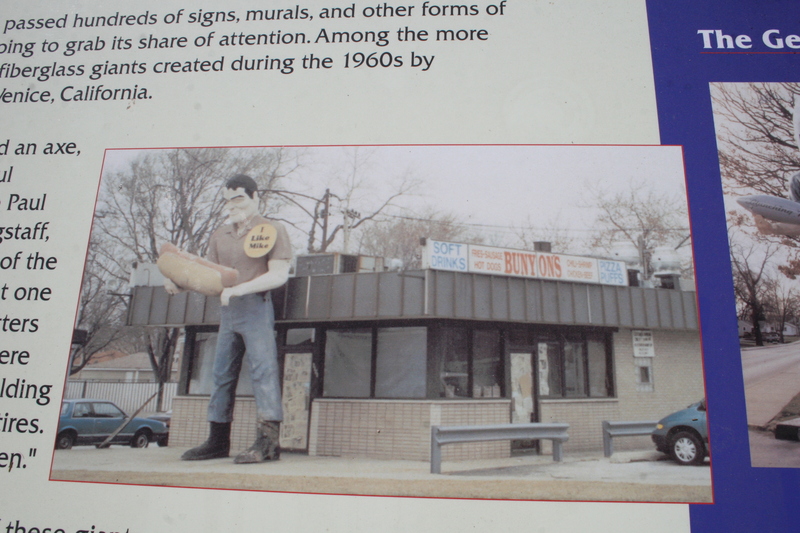 He was ordered by a man named H.A Stevens who was 43 at the time and wanted to start a hod dog stand in Cicero, IL. He heard about international fiberglass and the bunyans they were producing and flew out to Encino, CA to pick one up. He stated that this bunyan was already used by the oil companies at the time but also mentioned seeing many of the giants laying on their backs. Encino is 20 miles north of Venice and I was not aware of the giants being made or stored there. Also 1965 was in the hay day of muffler man production and business was going very well at the time so it seems odd this guy would be retired already. I am guessing the giant was new or almost new at the time of purchase and Mr Stevens payed 1,900 for his big guy. If you factor in inflation that was $14,084.37, a hefty price tag even today for a muffler man. On top of that he had it shipped to IL in 5 boxes and then had to have it set up. 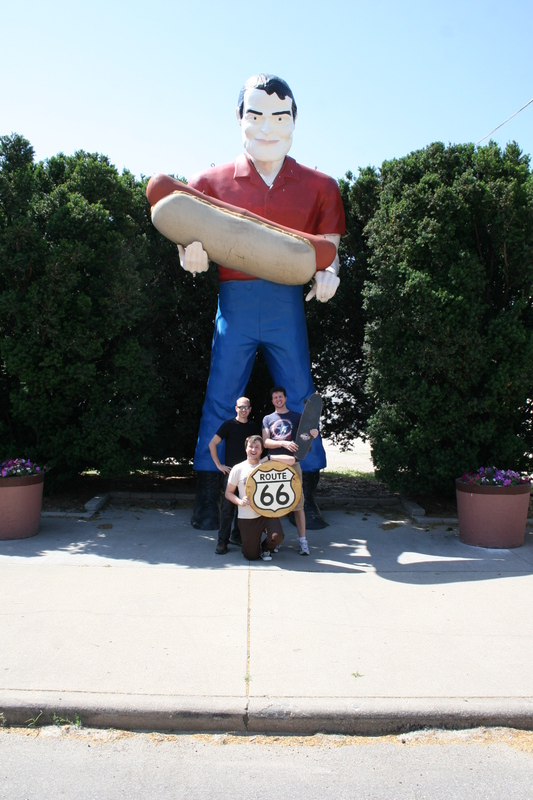 He replaced the standard axe with a giant hot dog and the muffler man was set up on January 8, 1966 on old route 66 in Cicero. That year was the golden year for muffler men, in 1966 both Texaco and Phillips 66 ordered hundreds of muffler men from International Fiberglass so the hot dog holding bunyan had a lot of company surrounding him. Mr Stevens named his restaurant “Bunyons” to avoid any copyright issues with other businesses. As other muffler men started to disappear he stayed on for almost 40 years at his post enduring bullets and arrows and probably other unpleasantries he doesn’t wish to remember. In the early days he stood on the roof but Mr Stevens wanted him to be more tangible to his customers and the children so he was moved down to the ground. In 2003 at the age of 81 Mr Stevens sold the restaurant and the next year his family was approached by John and Lenore Weiss representing the preservation committee of the Illinois route 66 Association. The muffler man was then loaned to the city of Atlanta, IL 150 miles to the southwest of where he stood for so long in Cicero. So today he still stands along old route 66 and is a major source of tourism for the little town. 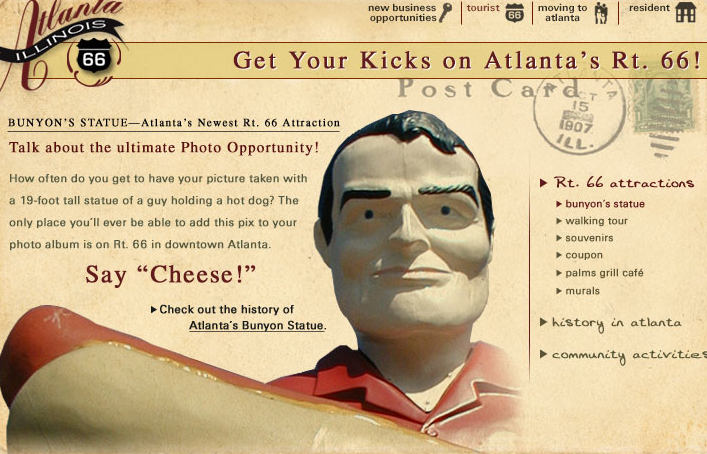 Literally thousands of people pass through Atlanta every year just to see the statue and get their picture with him. When the American Giants crew stopped by we learned he was getting a fresh paint job the following day by volunteers in the community. So he still looks as new as ever although I noticed a few signs of his true age. His torso no longer fits snuggly into his pants and a bit of a crack is visible. I also noticed his right thumb has been cut off a bit to make room for that giant hot dog bun. I have spoken with the painter that worked at International fiberglass and he remembers making hot dog buns for some giants to hold so I am a bit unsure if that hot dog was made locally in Chicago or if it is from International Fiberglass. So once more we learn about a man who’s life was effected by a tall silent muffler man and when people see the giant, they still remember Hamlet Arthur Stevens and his years of service to his country, his comunity and his hot dogs. He passed away at 89 but every day people still enjoy his contribution and travel miles to see it. Special thanks to those who interviewed Mr Stevens and got his story such as Roadside America and the Chicago Sun Times. 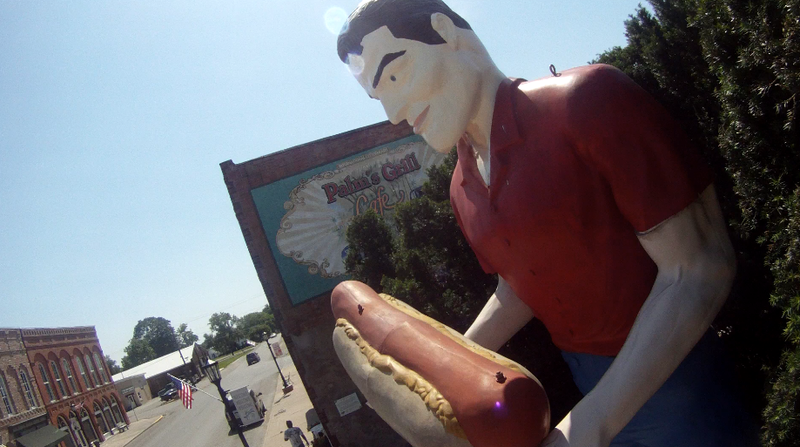 American Giants Episode #3 will feature this muffler man, town of Atlanta and our findings and adventures up old route 66.